Cirantille is an Altmer bard who can be found on a rock in Skywatch, speaking to an audience. She is the author of several books, although despite her travels she seems to be rather prejudiced. 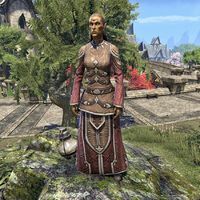 Cirantille also appears in Wrothgar, where she will need your help in recovering the pages of her research book. Scholarly Salvage: Deal with a threat in Wrothgar's wilderness. When you have accepted the contract from Arzorag, you can ask Cirantille more about the task. She'll say, "So, ready for another journey into the frontier? I've heard that some more of those brutish ogres were sighted doing ... well, ghastly things with my book. That will not do." You're certain ogres stole your books? "Of course! You realize I'm probably the greatest expert on ogre habits you'll ever meet. The very books they stole are the definitive work on the subject. I doubt there's anything I don't know about the creatures." Why did the ogres take your books? "How should I know? Really, do I look like an ogre? I mean, even the greatest expert can learn something new if she's open-minded enough and keeps her eyes open. Maybe they're aping us, looking at the pages and pretending they can read." "A fascinating creature—the exception that proves the rule? Perhaps he's just a brutish freak, cursed with intelligence above his station? Regardless, he must be slain and my books must be recovered. Can't have ogres thinking they're people!" Once you have returned to Cirantille, she'll ask, "I assume you've found my missing pages? Hand them over and I'll see what I can do with them." Here's your book. And Mad Urkazbur is dead. "Capital! Hmm, the cover's a bit bent and the pages are showing some boxing. Still, I appreciate your efforts. I'll need more of these pages recovered eventually. I did bring several dozen copies of the book, after all. I hope you'll be available." "I tell you, my fair readers, no other race on Tamriel chills me as much as the Argonian. Those scaly beasts are uniquely suited for the warm temperatures of our beloved south. If any race would cast a dark eye on Auridon, it would be the Argonian." "Some of you may wonder what I've learned since meeting the elder Spinners of Silvenar, and you need not worry. My research has shown their "prophecies" to be nothing more than conjecture and finely spun lies!" "As I pointed out in my bestselling tome, Ladies in Green, the Wood Elves are secretive in nature. Think on this the next time you see one tending to your most private letters." "The Wood Elven spinners do have magical powers, it's true. But in my research for "Spinners of Y'ffre", I found that much of their insight actually stems from a pervasive... some might say insidious... intelligence network." Even after she is killed, Cirantille may continue her racist tirades. ? This page was last modified on 5 April 2018, at 10:15.